Exterior view of the west side of the Jami Masjid, Jaunpur. 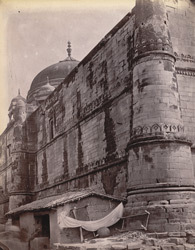 bl.uk > Online Gallery Home	> Online exhibitions	> Asia, Pacific and Africa Collections	> Exterior view of the west side of the Jami Masjid, Jaunpur. Photograph of the Jami Masjid in Jaunpur, Uttar Pradesh, from the Archaeological Survey of India, taken by Joseph Beglar in the 1870s. This mosque was founded by Sultan Mahmud (r.1440-1457) but was enlarged and completed by Sultan Husain Sharqi (r.1458-79) in 1478. It is the largest of the Jaunpur mosques with many features in common with the Atala Mosque of 1408 in the same city, such as the large pylon in the centre of the sanctuary facade with sloping sides. The building is raised on a high platform reached by three entrance gateways with steep flights of stairs. This is a view of the exterior of the west side of the mosque, taken from the south-west corner of the mosque looking obliquely along the exterior wall. An almost identical view appears in A. Führer and E.W. Smith, The Sharqi architecture of Jaunpur (Calcutta, 1889), pl. xlv.